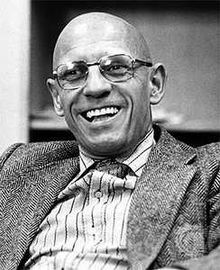 ‘Do not ask who I am and do not ask me to remain the same…’, wrote Foucault: ‘….leave it to our bureaucrats and our police to see that our papers are in order.’ I think he’s playing with two senses of the word identity – which in French or English derives from the Latin word idem, meaning ‘the same’. The Oxford English Dictionary interestingly telescopes at least these two meanings into its definition of the word: ‘ The sameness of a person or thing at all times or in all circumstances; the condition or fact that a person or thing is itself and not something else; individuality, personality.’ Foucault’s carte d’identité would have been required by French law to establish that he was, in a legal or social sense, ‘himself and not someone else’: but is this the same as his ‘personality’, and does his ‘individuality’ depend on his being, in other ways, ‘the same at all times or in all circumstances’? His answer to both questions is no, and we might incline to agree. But in what ways do we need to ‘remain the same’ in order to retain our sense of who we are, or to be recognised as who we want to be in society? I’ve been reflecting on three different ways we can choose to think about the self. The first comes from Gestalt psychology, in which ‘the self’ is continually in flux, being made and remade as each of us interacts with others. There’s no such thing as a ‘self’ without a social context. The second I get from re-reading James Hillman’s book, The Soul’s Code, in which he proposes that each of us has a unique ‘daimon’ that, unknown to us, arranged the circumstances of our birth and upbringing in a way that fits our individual calling and purpose, and guides and protects us through our life. Hillman dislikes the word ‘self’ and avoids it, preferring to describe each unique life as an ‘image’, which may become revealed over time but doesn’t change – ‘the innate image of your fate holds all in the co-presence of today, yesterday and tomorrow…. For this is the nature of an image, any image. It’s all there at once.’ The third I’m getting from Foucault himself, who sees the self as something that ‘we have to create ourselves as a work of art’. On the face of it these are three quite different ways of thinking about self. Self as a fluctuating, contingent impression; self as a unique and unchanging destiny; self as something each of us creates for ourselves. But I find each of them has something in it that is compelling and attractive, and each may be equally ‘true’ – if we want to use that word – or at least, equally useful. Also, I suspect each of these taken too dogmatically reveals its own shadow, which we would do better to avoid. So the shadow of the Gestalt model might be a tendency to irresponsibility and annihilation; that of the Soul’s Code, a loss of the sense of free will; of Foucault’s, a kind of narcissism. Maybe it’s good to hold on to all three, with each acting as a corrective to the others. Yes, we create who we are in each moment through our relations with others. Yes, we can think of creating ourselves as if it were a work of art. And yes, just as a work of art seems to unfold itself and realise itself as we work on it, we can choose to think of what we discover as a unique image, eternal, and greater than ourselves. If we want to. Do you know ‘I am’ by John Clare? http://rpo.library.utoronto.ca/poems/i-am I love Clare’s defiant sense of self, held up as a shield against his own derangement/ abondonment. I think you are changed by what you contemplate.